Posted: Tue, May 10, 2011 : 4:40 p.m.
A coalition of student and employee organizations at the University of Michigan is lobbying for the university to help the city of Ann Arbor avoid deep cuts to the city's fire department. With 12 positions slated for elimination in the fire department over the next two years, U-M students and employees are requesting that President Mary Sue Coleman, the Board of Regents and Provost Philip Hanlon take steps to intervene. "We believe that the university needs to intervene to prevent further reductions in service," the letter reads. "It would be unconscionable for the University of Michigan to stand by and allow this trend to continue. We do not want a tragedy to be the trigger for the university taking action while the ongoing safety of U of M students and employees is put at risk." 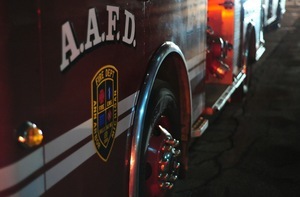 Deep cuts are proposed to the Ann Arbor Fire Department, and students and employees want the University of Michigan to intervene. The letter is signed by the leaders of six different unions and two student organizations, including the U-M Central Student Government, Lecturers’ Employee Organization, Graduate Employees’ Organization, U-M Professional Nurse Council, International Union of Electrical Workers, U-M Skilled Trades, Students Organized for Labor & Economic Equality and AFSCME #1583. The Ann Arbor City Council meets on Monday to consider the city budget, though it appears likely a vote won't happen, and the meeting will be continued to a date to be determined later this month. The letter does not specifically ask that the university kick in funding, but rather asks that university leaders "immediately use all the political influence you have" in Ann Arbor and in the state Legislature to prevent further budget cuts to the fire department. "We're letting them figure out how to work this out," said Bonnie Halloran, president of the Lecturers’ Employee Organization at U-M. "We know they already own one of the fire stations. We know some of this has to do with money coming from the state, and some of it is about Ann Arbor city politics, so it's whatever they deem necessary." Halloran said the university's physical properties — valued at more than $5 billion and including more than 33 million square feet of building space — are important state investments and ought to be protected with appropriate fire prevention services. According to information supplied by the firefighters union, it now takes almost six minutes on average for one fire engine to get to the scene of an emergency. "The risk to life and property are enormous," the union claims in a statement appended to the letter to U-M. "In the past 10 years, there have been numerous fires in off campus neighborhoods that have resulted in fatalities, 'near misses' where students have had to jump from windows or roof tops to escape a fire, and total loss fires involving fraternity houses." Download the statement from the union.